Antioxidants food guide - quickly find the REAL antioxidant value of hundreds of foods. Find the antioxidant value of hundreds of foods. 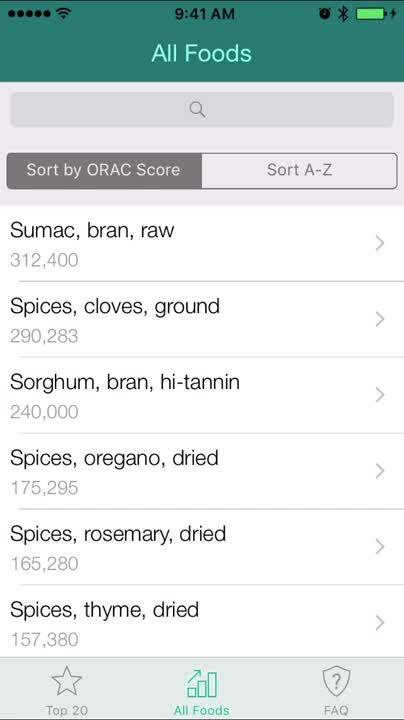 The app allows you to browse through sort all foods by their ORAC value, or sort all foods alphabetically. 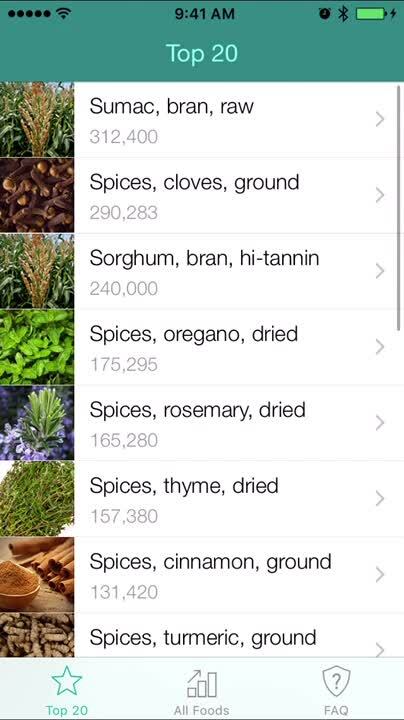 You’re also able to search for specific foods. Each entry includes additional details as well. 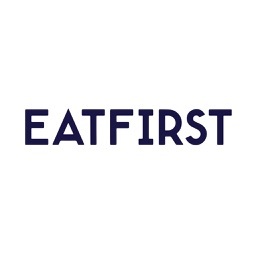 The top 20 fooods. 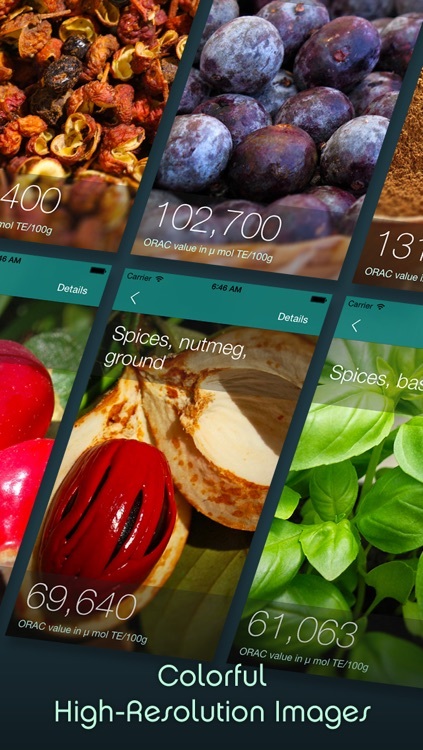 The app allows you to browse through the top 20 foods. Antioxidants is a comprehensive food nutrition guide that reveals the ORAC values of over 350 popular foods! 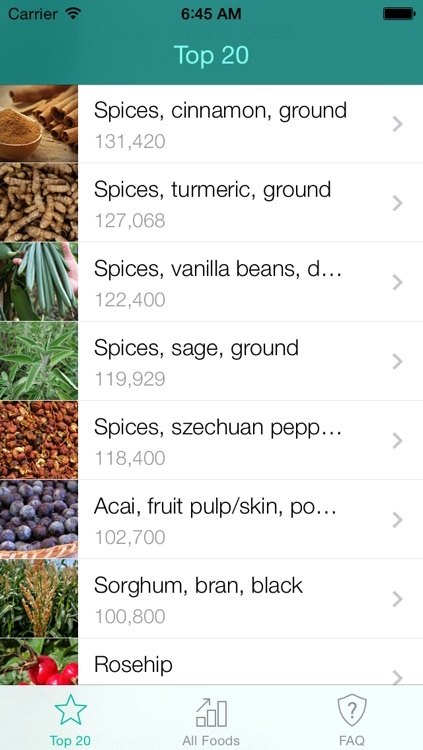 Quickly scan the top 20 foods, or browse the entire database in a searchable, sortable list. 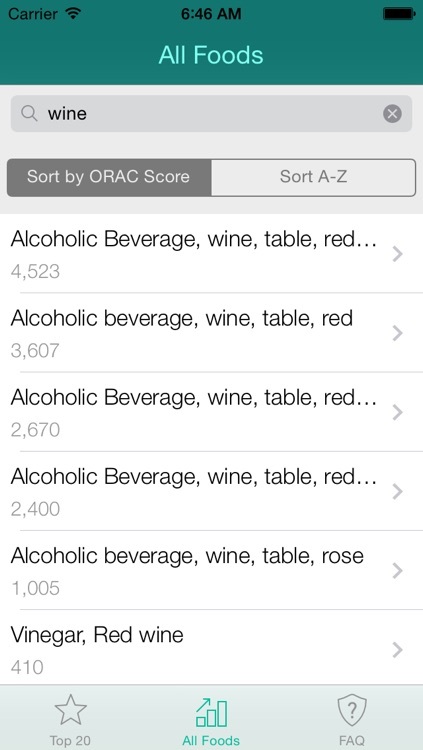 The ORAC (Oxygen Radical Absorbance Capacity) unit, ORAC value, or "ORAC score" is a method of measuring the antioxidant capacity of different foods and supplements. 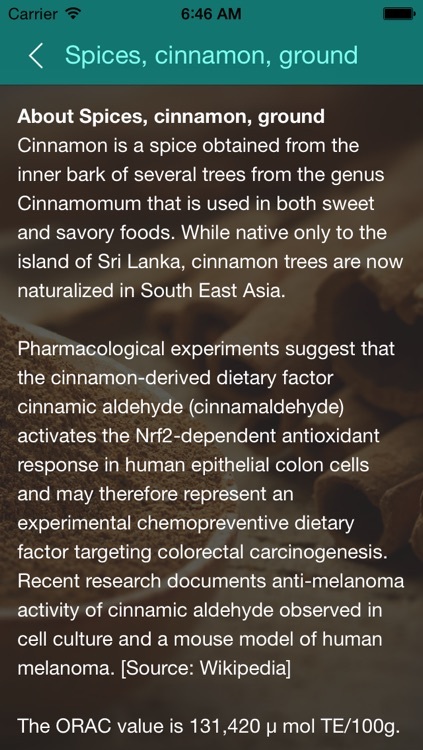 It was developed by scientists at the National Institutes of Health. 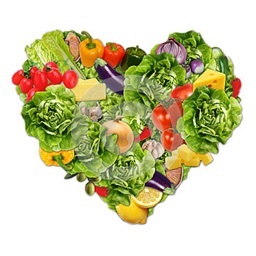 While the exact relationship between the ORAC value of a food and its health benefit has not been established, it is believed that foods higher on the ORAC scale will more effectively neutralize free radicals. According to the free-radical theory of aging, this will slow the oxidative processes and free radical damage that can contribute to age-related degeneration and disease. 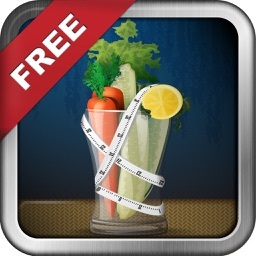 - Discover healthy fruits, vegetables, spices, and other foods to add to your your diet, promoting wellness and longevity. 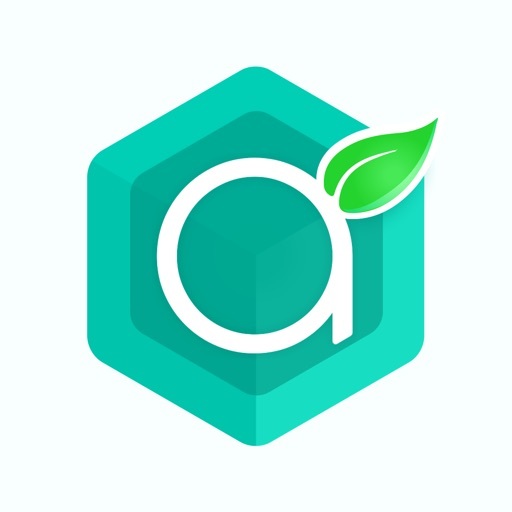 - Whether you're looking for clean diet foods or just looking to boost the variety of your everyday eating plan, this food app is a powerful tool. 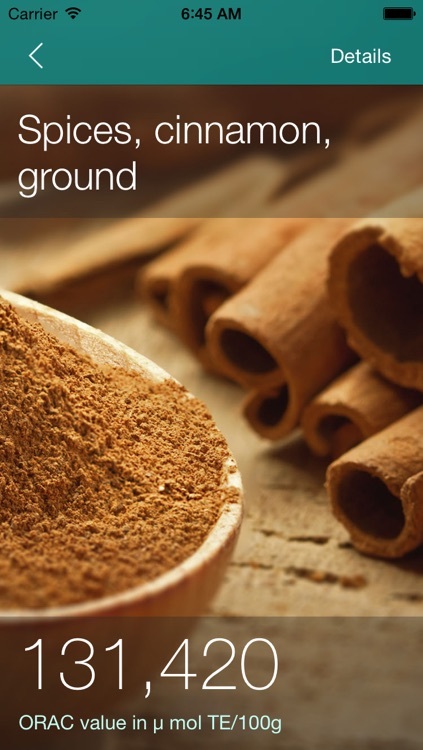 - Learn the surprising truth: which everyday foods are high in antioxidants and which “superfoods” don't measure up. - Get accurate data based on the latest USDA research, not marketing hype from supplement companies. - Quickly and easily access data using the Top 20 Quick View, plus powerful sorting and search features. 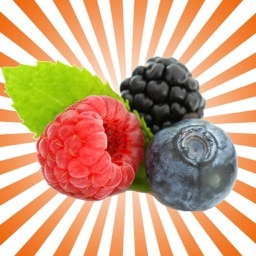 - Enjoy colorful photographs of the top 20 foods, beautifully optimized for Retina iPhones and iPads. Today’s AppsGoneFree list includes a sports game, a health app, and a productivity app. 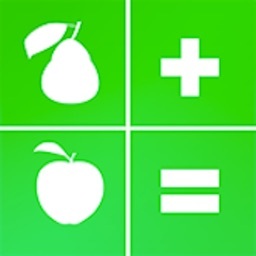 Today’s AppsGoneFree list includes a rhythm game, a puzzle game, and a health app.